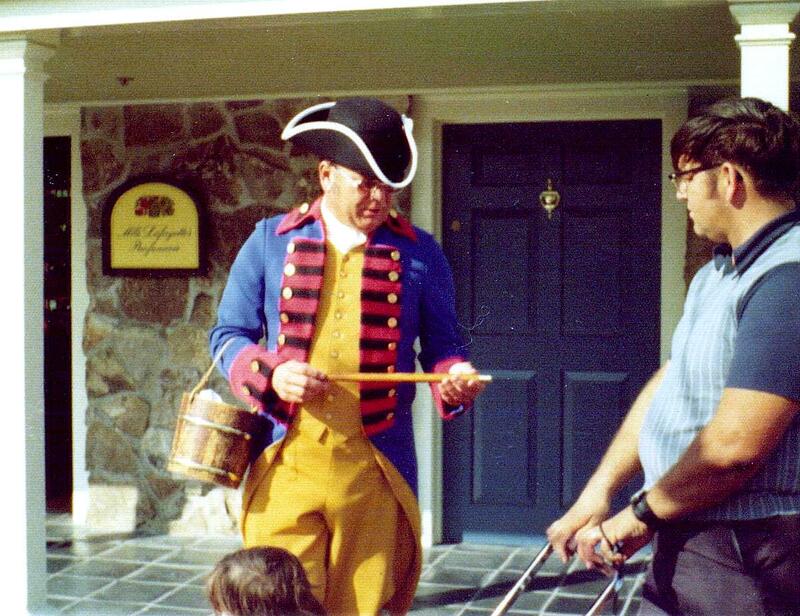 Truthfully, we would all be very blessed if every seemingly minor aspect of early Walt Disney World were as well documented as that longtime mainstay of Liberty Square, Olde World Antiques. 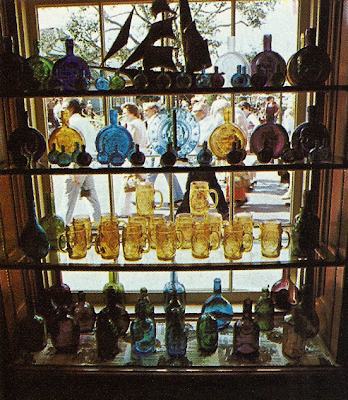 It gets rather extensive coverage in almost every Walt Disney World souvenir publication up until the early 1990s, usually warranting at least an interior picture and a mention in the body of the text, an honor which was rarely granted to attractions such as If You Had Wings or Mr. Toad's Wild Ride. 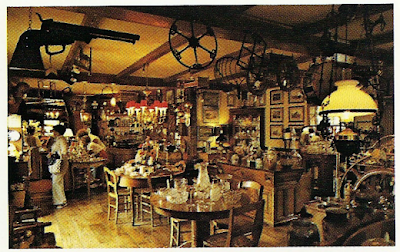 And while Disney apparently never bothered to publish photographs of the early interiors of something like the Heritage House or the Magic Shop, it's startlingly easy to find documented evidence of what Olde World Antiques was all about. In a way, this may be a reflection of the prestige Disney attached to this shop in particular. David Koenig relates in Realityland: "Resort-wide, the [Merchandise] department was led by Jack Olsen, a heavy-set old-timer, who usually dressed in shorts and a golf shirt and constantly preached that his stores were not factories. He wanted them operated first and foremost as part of the show, rather than designed and operated to maximize profit. Even though souvenirs imprinted with Mickey Mouse and other characters were the best selling merchandise in the park, none were sold in Adventureland, Frontierland, or Liberty Square. Everything had to be themed to the period." Koenig then quotes a manager of one of these shops, who says: "Disney had very little business knowledge. Anything Jack Olsen wanted was okay. It didn't matter what it cost.... The antique shop in Liberty Square made about $100,000 a year - but spent $1 million! Money didn't mean a thing. They were movie people, there to put on a show." So obviously some of the prestige of Olde World Antiques comes from its status as "part of the show", if a very elaborate and fanciful version of the show. Some of the emphasis may also be placed because of the shop's connection to the Disneyland original, the One-of-a-Kind Shop, apparently a Walt Disney creation. 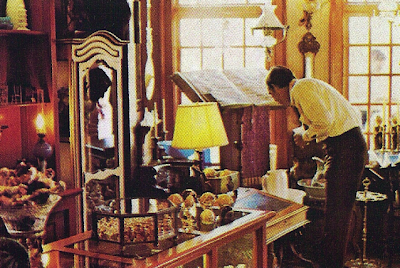 Stories of Walt Disney scouring the Crescent City for real antiques for his miniature New Orleans circulate to this day, and his haul apparently included furnishings for Club 33 and a big brass espresso machine for the Creole Cafe (Kevin Yee tells funny stories about being assigned to polish the huge and totally inoperable thing). 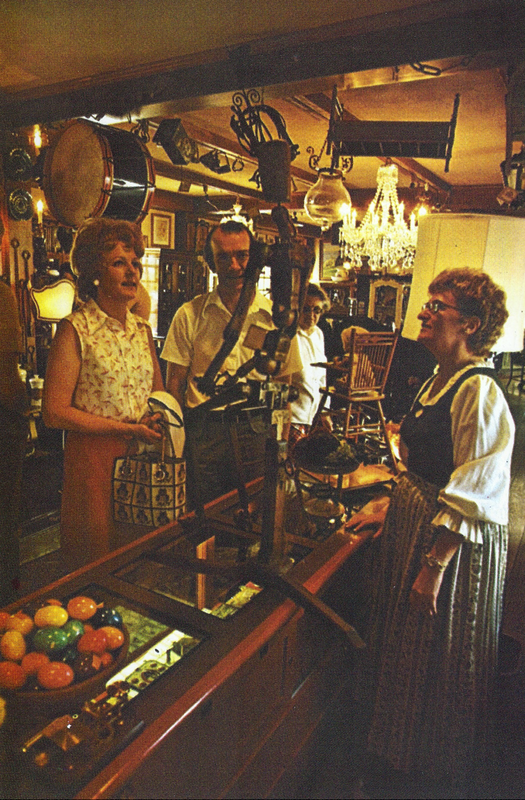 Being in the antiques business even became something of a tradition for Disney, which at one point operated three distinct antiques shops - The One-of-a-Kind Shop, Olde World Antiques, and Von Otto's Antiques at the Walt Disney World Village. The Liberty Square shop outlasted them all. "Time has not softened the desire of ladies and gentlemen to dab on a essences of imported perfumes and colonges. 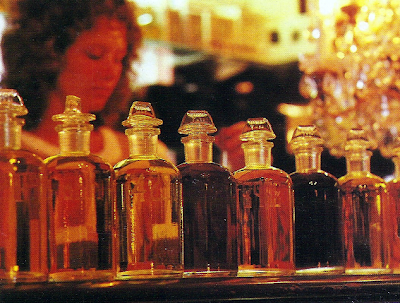 Sweet and spicy scents, drifting into Olde World Antiques from Mlle Lafayett's Parfumerie, entice guests into this little French-decor shop. Among the crystal and china atomizers, soaps, pressed powder sachets and potpourri, are hundreds of popular and hard-to-find perfume products, including famous French lines. Yet, if a guest prefers a more personal fragrance, the hostess will custom-blend a perfume, choosing from the shop's seven basic perfume oils, ranging from the sweeter floral and citrus notes to the more heady scents of spice and musk. Then, each custom blend is numbered and recorded so that the guest may later re-order that same perfume without being present." 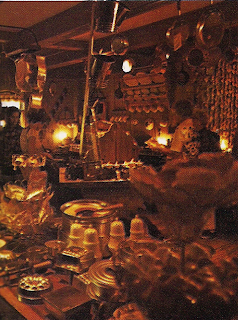 The Silversmith, of course, existed mostly to lend atmosphere to the square, and any long-time Magic Kingdom visitor who remembers the beautiful silver pieces lined up in the windows, glinting in the Florida sun, will likely best understand the tactile loss this shop represented when it switched to generic Christmas items. Aside from that rather abstract addition, the Silversmith also name-dropped Johnny Tremain as the proprietor, which forged a very strong link to the nearby Liberty Tree via the fictional history of Tremain's apprenticeship, hanging of the lanterns in the liberty tree in Boston, and of course the Disney film made from it. 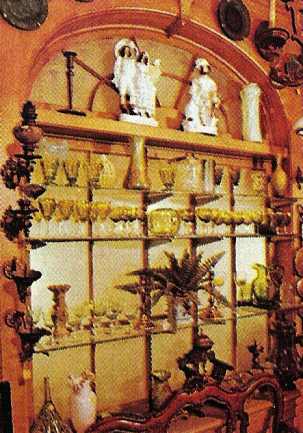 "The antique shop at Walt Disney World deals exclusively in objects from abroad. Once, and sometimes twice, a year, Otto spends eight weeks searching for unusual items in Italy, France, England, Denmark, Holland, Austria, Spain and Germany. He deals only with reputable agents who, through long association, have learned to anticipate his requirements. Well, possibly. But as one looks at the bronze, 18th-century chandelier, complete with coiling cobras and gruesome gargoyles, that hangs in the shop, fantasies reminiscent of Edgar Allan Poe are brought to mind. And the gay but silent rocking horse from England, still bearing the scuff marks of its tiny rider in 1780, stirs up memories of Jane Austen nurseries and comfortable nannies. Guests not only return to visit with Otto and his associates but telephone from as far away as Australia to order antiques they have seen and can't forget. The shops have excellent shipping and crating facilities and will deliver anywhere in the world. 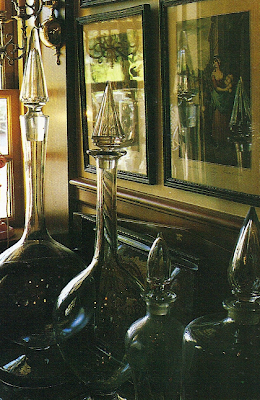 Any antique purchased at Walt Disney World is guaranteed to be exactly what it purports to be - and that includes place and year of origin, quality of craftsmanship, and authenticity." 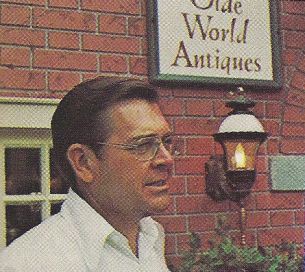 Olde World Antiques continued to meander along until the mid 90s, when the plug was finally pulled to make way for an expanded version of a shop which had been operating in Fantasyland under the name Mickey's Christmas Carol since the late 80s. 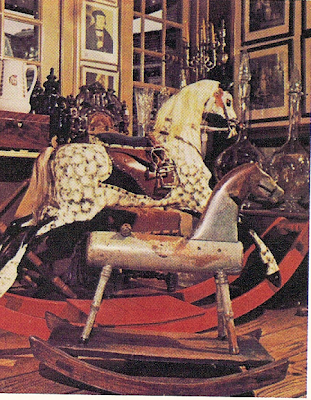 The Mickey's Christmas Carol location became Sir Mickey's at the same time and so Otto's antique collection, all the silver, the perfume, and the antique rocking horse left the Magic Kingdom forever. Apologizes, by the way, for the somewhat wonky images... by the time I realized some of them hadn't been properly cropped it was already too late. The picture of the fife player (with the building behind him) was shot by my mother in February 1972. I am not related to the chap in the picture talking with the fife player. He was a college friend of my mother's, who worked at the park at the time. Other photos from that time show that during Feb of that year, Rivers of America and Tom Sawyer Island were actually still under construction, and the river itself was drained. The riverboat was sitting outside the park, next to the floats for the Electrical Water Pagent (and there were still woods where now stand the buildings that house the spectromagic parade floats). Is this the crux of the matter? Disney turned from "show" to "profit center"? Yikes, so that's where I got that picture! Thanks very much for making this stuff available online, Joe. Would you like me to link to your website or credit you? I have been of the opinion that the "Disney experience" has been downgraded over the last two decades. In the past, I DID feel like a guest. Sadly, this is no longer the case and the title "guest" has morphed into customer. I also felt that in the past Disney's philosophy was not so dollar-centered. (and in my opinion is now outright money hungry) This article is proof to me that my feelings are/were grounded and valid. For me at least, the best Disney has to offer is in my memories. I purchased a small brass horse shoe from the Olde World Antiques in the 80's which I still have today. It is tangible proof and a reminder of how things used to be in WDW. No worries. Just leaving my comments where they are here and I'll just mention that these other pics of the very early years of the Magic Kingdom can be found here. Correcting my comment, that was in February 1973, not '72. Another amazing article! I only wish I had been older when I was younger (?!) so I could have appreciated the MK of old on a more sophisticated level. 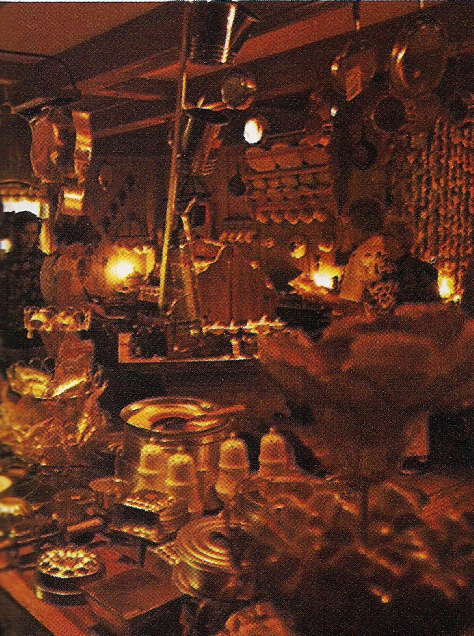 Perhaps, even if I didn't really know much about antiques as a child, shops like this one helped shape my overall enjoyment of WDW back then, even if only because it led to a more enjoyable experience (and better karma) for everyone. Can you just imagine anything like that existing today? What do I know, but here is my opinion. The notion that it cost a million to operate that location seems over the top. True, I suppose a million (in 1972 ?) could credited against the shop, but what was the return for the Magic Kingdom, 2, 5, 10 million? The 100 G should be considered icing, used for a shop party. I had to laugh at the textbook quote in Realityland that " they weren't business people"... precisely. I remember so little of the shop, and so little of the volume of people that may have entered. It's hard to imagine what today's throngs would do to this place, just as the bathrooms are sieged at Liberty Tree. And yet, even today it still seems so right. I was looking for a clock for the mantle, a memento of my trip. How about a battery operated piece of future landfill? No thanks, you can keep your "maximum value for the customer". I sometimes wonder though if it really boils down to effort. 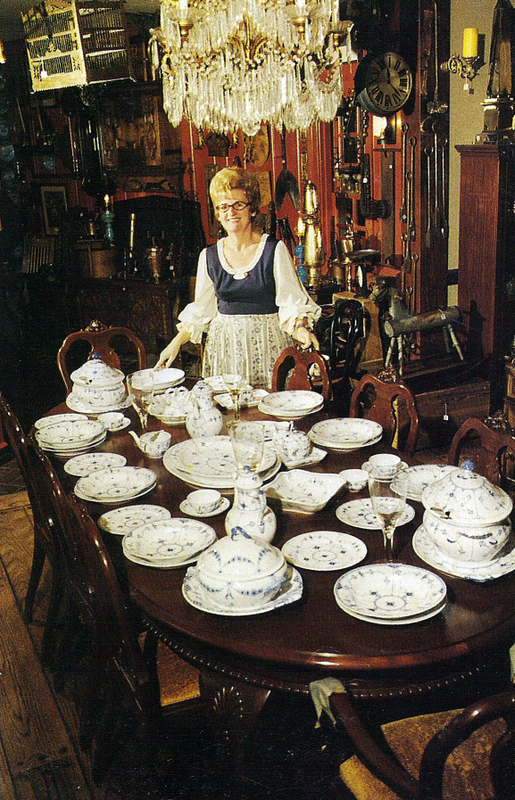 Speaking of effort, I always thought that classic shot of the place setting was for some sort of first class dinning in Liberty Square back in the day... what a dufuss. LOL Phil I thought the same thing until a few years ago. 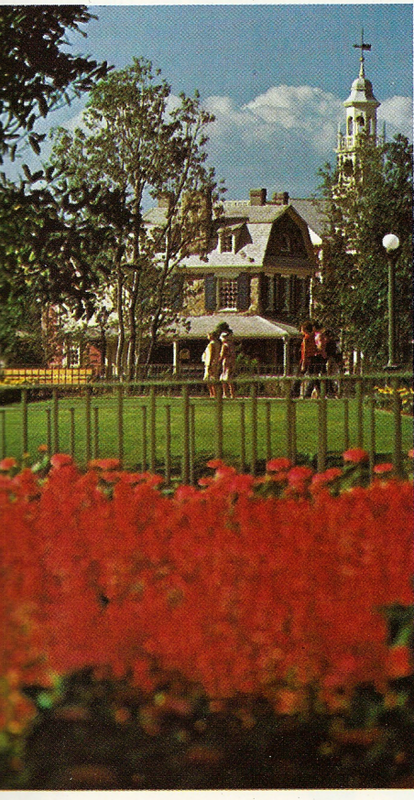 That picture was in my very first ever WDW pictorial souvenir and for decades I'd skim right over it, thinking it was a picture of the Liberty Tree Tavern. I think overall however that we must keep in mind as we celebrate something like Olde World Antiques or the WDW Village that what made it good is also what makes it an impossibility today. In September and October 1971, Magic Kingdom was working like a well oiled machine, hosting between 10,000 and 15,000 people a day, up to 25,000 on weekends. To give you an idea, if MK today has a day of 25,000 attendance or less, it looks like the place was evacuated. And MK attendance hasn't fallen below 20,000 since the onset of the recession. So that's just one reason why a tiny shop crammed full of valuable breakables wouldn't fly today. Can you imagine little baby Alejandro running through the clutter of authentically valuable junk? I also think that while the general sophistication of Disney's product has dropped considerably, the public's level of sophistication has more or less remained stable. So even in 1976 the number of people actually getting much out of the antique shops was only a tiny portion of the target audience. So there's that too. Combine a tiny but highly visible space with a niche product and I'm frankly amazed that it lasted as long as it did. I'm also not sure that it could, or should, have lasted into the 21st century. As for the authenticity of the figures, I can't vouch for that other than that I copied the interviews verbatim out of the Koenig text. I will say that I know that a single shop in the MK may bring in several ten thousands of dollars in merchandise sales alone in a single busy day, and that's just one shop in merchandise. The figures didn't seem so extreme to me when I read them. So right you are, as those facts are most indicative to what we see today. Yet the little show shops clearly represent a "money only as a means to an end" philosophy. A notion I suppose that would outshine any contemporary back story for the MK, and one that I cling to. It also should be known that I'm pretty much broke, to bring a smile to anyone who would care to bash that philosophy. As far as the Liberty Tree mix up, well it's good not to be the only one. 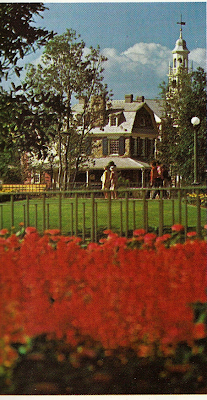 However a look over that old booklet leads you to believe that the photos were purposely juxtaposed in that manner. Anything to do with Antiques or Collectables is too cool. Especially with a Disney tie-in. Please check out my blog at Disleelandia.com (The Virtual Disneyana Archive) and see what you think, and maybe we can Link up our Sites. Hi Foxxfur: Not surprisingly, my search for information about the Liberty Square antique shop led me here to your excellent site -my favorite of all DW fan sites. I realize I am commenting nearly ten years after the original post, but I can't help adding a few words to the conversation. I am an antique specialist who works for a large auction house. I am also a featured appraiser on Antiques Roadshow, if that lends me a little cred. I find the notion of a genuine antique shop in the Magic Kingdom almost mind-boggling. From what little the photos reveal, Olde World Antiques could as easily be identified as one of the venerable shops on Philadelphia's Pine Street "Antiques Row" or any other such stretch in Boston, Charleston, Annapolis, etc. It's all there: the Staffordshire pottery, ash Windsor chairs, cut crystal, tin trade signs... It's beautiful. Not only could no such store exist in the Magic Kingdom today for the reasons you pointed out, I am sorry to say few such stores exist at all anymore. In Philadelphia, where I live, Antiques Row is now long gone. I saw it vanish over the course of my ten-year career working in the city. The same is happening throughout the country. I am not talking about come-and-go, hipster "antique" shops selling 8-track players and old Coke bottles. Proper old antique shops have in large part become relics of the past just like their stocks of dust-covered 19th century English home wares. The obvious explanation for this is a general, generational change in taste. 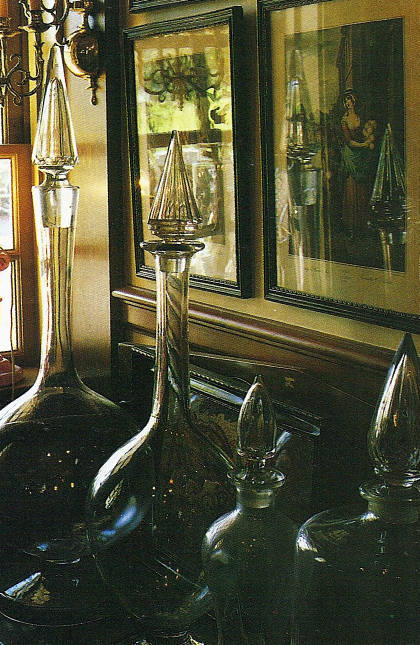 Fewer people are decorating their homes with antiques. Even I don't. Another important factor in the demise of antique shops, though, is the rise of auction houses. In the heyday of American brick-and-mortar antique shops, the dealers would buy at auction and sell the marked-up art and antiques retail in their shops. Auction houses stood as the secondary, wholesale, marketplace for the trade. This changed with the ascendancy of Sotheby's and Christie's in the US and the steep rise of what is called the "buyer's premium": an additional charge a winning bidder at auction pays to the auction house based on the amount of the winning bid. Auctioneers, therefore, earn a fee from both the seller (commission) and the buyer (premium). Standard premium among major auctioneers who have followed Sotheby's lead now stands at 25%. So, a winning bid of $10,000 for let's say an 18th century wooden rocking horse (unlikely, but bear with me), would generate a $12,500 invoice. This premium took such a bite out of the antique dealer's profit margin, it lead many to abandon their shops and adopt a model in which they themselves sell almost exclusively through auction. Auction has therefore become the primary market for many categories of art, antiques and collectibles while the number of "olde" antique shops in the country continues to dwindle. None of us in the trade are happy about it. It just is. That the Olde Word Antiques shop never turned a profit comes as little surprise. In its day, though, it would have at least been understood as a shop. There would have been some paying customers. Now, I can only see park-goers reacting to such a shop with bewilderment, perhaps even mistaking it for an imagineered show space like the Jungle Cruise queue. It makes me sad. I find the idea of an antiques shop at Disney World thoroughly enchanting. But it's a family-of-four-in-matching-neon-Under-Armour, sunglasses-on-the-ballcap (Disney) world anymore and that crowd just doesn't think of antiques the same way. It's true that the social function of houses in general is changing rapidly; there's less demand for a beautifully appointed dining room as the social centerpiece of the house, never mind one furnished in brown wood antiques. I spend a lot of time going to look at antiques and general old junk in my off time, and I can say that the huge old pieces of furniture you see in shops from the Victorian era or the 30s just sit there unsold year after year. On a larger level, however, the Eisner era simply devastated the in-house support for anything so esoteric and memorable anyway. The head of Disneyland merchandise, hired and directed by Walt, was told to put in interesting stores even if few things in them sold - and this mentality carried over to the company's inheritors in the 70s. New Orleans Square had a silversmith, gourmet cooking store, a wrought iron store, an open air newspaper stand, shoeshine, and an antiques shop - mostly for show. The thinking always was that some other store would take up the slack, thus Main Street offering a magic shop and a tobacconist. As the old guard retired, Eisner brought in more and more people from the retail industry who were trained to get rid of anything that didn't move, no matter how nice. I've defended Disney's new mall, Disney Springs, as being thematically interesting, but fact is that all of its stores are just clothing stores you could find in a high end mall. Disney used to be so proud of offering a theme park full of unique shops they even sold a special pass in December just to enter the park and shop. It's a shame there's less respect for the possibility to make shopping an actual experience instead of just another way to shovel more money into the vault. I covered this in-depth in a recent article about Adventureland's long-gone shops. Thanks for stopping by, I'll keep an eye out for you on Antiques Roadshow!